Have you ever noticed that when you swipe your debit card at certain stores, such as Wal-Mart, the credit card machine automatically defaults to make it a debit card purchase? There is a reason for that. It is cheaper for the merchant, but that does not mean you should use your debit card all of the time. There are differences, especially with respect to liability of losses, between using your debit card or credit card that you need to be aware of in order to protect yourself. 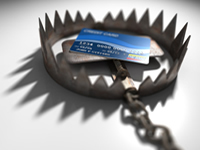 If your credit card is lost or stolen, your maximum liability under federal law for unauthorized purchases is only $50. With a debit card purchase, your liability for unauthorized use depends on how quickly you report that your card has been lost or stolen. For example, if you report the loss within two business days after you realize your card is missing, you will not be responsible for more than $50 of unauthorized use. If you do not realized the mistake for 60 days, you may have to eat $500 of the theft from your lost or stolen debit card. Not only can you lose a lot of the money in your bank account, but you may to responsible for an unauthorized purchases that dip into your line of credit for overdrafts. Using a debit card that is connected to your checking account poses more risk to you than using a credit card. Therefore, you must be extra cautious when using a debit card for retail and gas purchases or buying online. The main risk of using a debit card though is the fact that it’s directly connected to your checking account. You can also run into a problem if you are dissatisfied with a purchase. When you purchase an item with a credit card and that item turns out to be defective or if you have an issue with the merchant, you have a right to withhold payment until the issue is resolved. You do not have that right under debt card purchases. You have to settle problems directly with the merchant and not use the leverage of the credit card company and their withholding power. This is one of the main reasons that I love using my American Express card. They are pit bulls going after merchants that do not treat their customers correctly. Companies are charged a fee of approximately 2% to 4% of the purchase price by the credit card companies, called merchant fees, for the right to use their credit card systems, to actually collect the money from the customers, and to forward the money to the businesses usually that same day. American Express is notorious for charging a higher merchant fee to companies, and that is one of the big reasons that that particular card is not honored by some stores. If a company convinces you to charge your purchase with a debit card using the debit funciotn from money straight out of your checking account, they bypass that merchant fee and possible pass on a point-of-sale fee directly to the buyer. You are also at more of a disadvantage when you use a debit card at certain retailers such as hotels, car rental companies, and gas stations. That’s because merchants authorize and reserve a specific amount of money in your account to make sure you have enough money in your checking account to pay. This hold can be placed on your checking account for days possibly holding up funds you need elsewhere and maybe bouncing checks. You run the risk of inadvertently writing checks above what you believe is available in your account. You may either incur a number of overdraft charges. Because you are much more likely to bounce checks, it is better to put small purchases on your credit card versus your checking account’s debit card if you have to charge those types of purchases. For example, is it really worth paying $3 for a sandwich at lunch only to incur an overdraft charge of $30 later? Be careful when using your debit card to make purchases. It is important to know the liability issues should something go wrong. There is the potential for a wrong move, lost or stolen card to crush your budget. Cash Is King in all cases, without question. I cannot believe you are encouraging people to use credit cards in this day and time. Cash is King; while Debit cards are Queen and Credit cards are Jokers. One thing you failed to mention about debit cards is that now banks have automatic balance updates sent to cellphones and emails, after each purchase. So, nobody should be ignorant. This is fantastic for me. I always know what my available balance is and regarding those car rental holds, I know my avail balance for that too. It’s all online, but are we “checking” our checking accounts? It is about being financially responsible; setting balance alerts daily and actually being conscious of them. People that are still in the dark about their checking accounts are just as foolish as credit card users. They spend what they don’t have. But of course this is my opinion. I do also practice what I preach. Credit cards are for fools however I always appreciated American Express especially if they still require All the money at the end of your cycle. As for others, they’re rip off artist. Keep writing though this is good stuff. Thanks for the comment. I’m not encouraging people to use credit cards. I was just making people aware of the pitfalls of debit cards that they may not be aware of. While I too am not a fan of credit cards, I am a huge fan although and use only an American Express charge card just for the reason you mentioned, required to pay off your balance at the end of each month every month.